Halloween Decorations don’t have to be expensive. 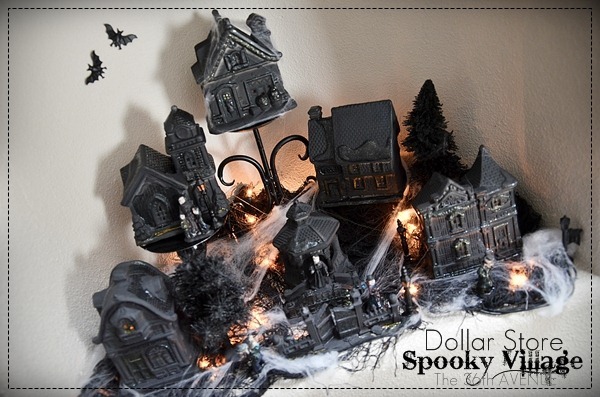 DIY Halloween Crafts are so fun to make and today I’m sharing how to make a Halloween Village in minutes for ten dollar! I love this! 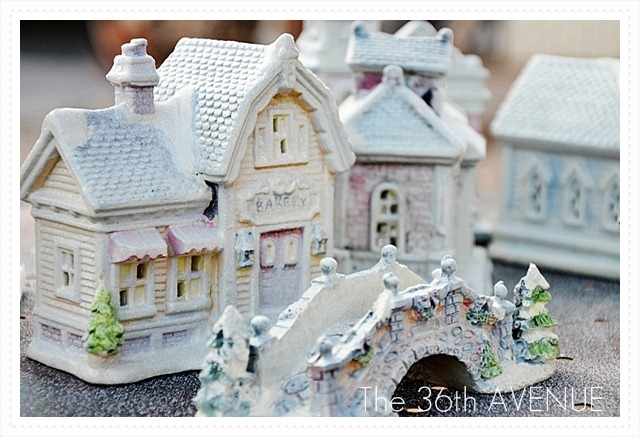 ©the36thavenue.com DO NOT COPY, SAVE, OR PASTE THIS COLLAGE IMAGE! You gotta to love the Dollar Store! 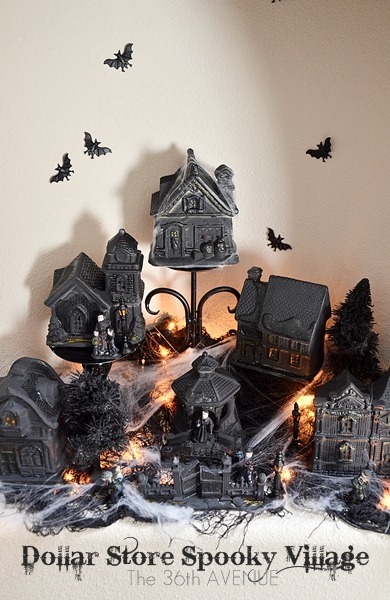 Where else can you get a Halloween Village for $10? Check out ours… My kids love it! 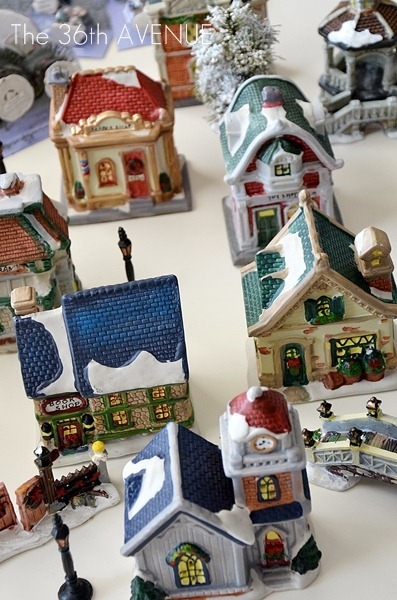 At the Dollar Store they now have their Christmas houses, trees and little ceramic figurines. Get as many as you want to be part of your village. We chose the people that could look a bit suspicious. The man caring a bag on his back, the people burying something. 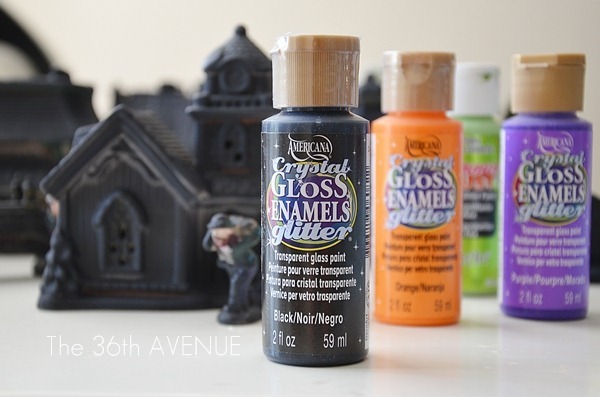 The first thing you want to do is to spray paint everything in black. The faces of the figurines are scary as they are so we put some play dough on top of them to protect them from the paint. After, it was time to turn the village dark. 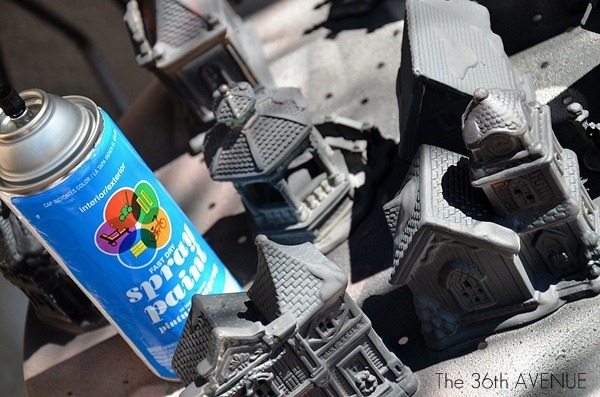 Spray paint everything, the houses, the trees, the people. Don’t worry about painting it perfectly. 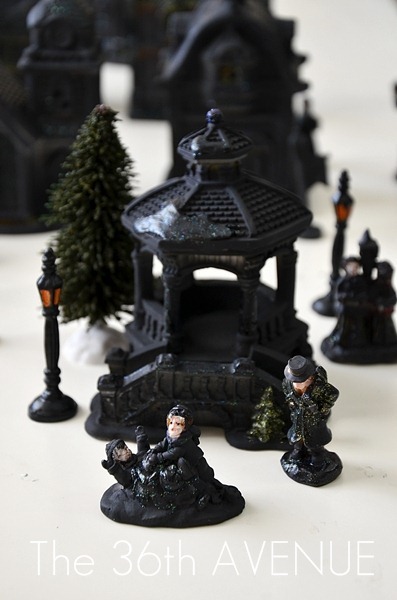 To give the houses and the figurines some dimension I used Glitter Gloss Enamels. and the frames of the doors and windows… the same with the figurines, just a few highlights. Look at the people, they don’t look so sweet anymore. Boo Waa Haaaa Haaa Haaa! At this point all we had to do was to display the Village. Make it look realistic, use boxes and candle holders to make different levels. Add fake spider webs to give the effect of fog and lights to create shadows. We even added some glue dots to the plastic bats we found also at the Dollar Store. So? Are you going to make your own? Last year I did something similar for Christmas. 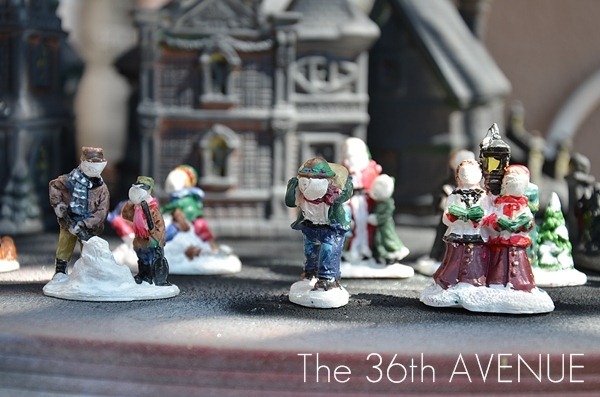 I gave a Dollar Store Christmas Village a makeover. I loved how they turned out. So pretty. 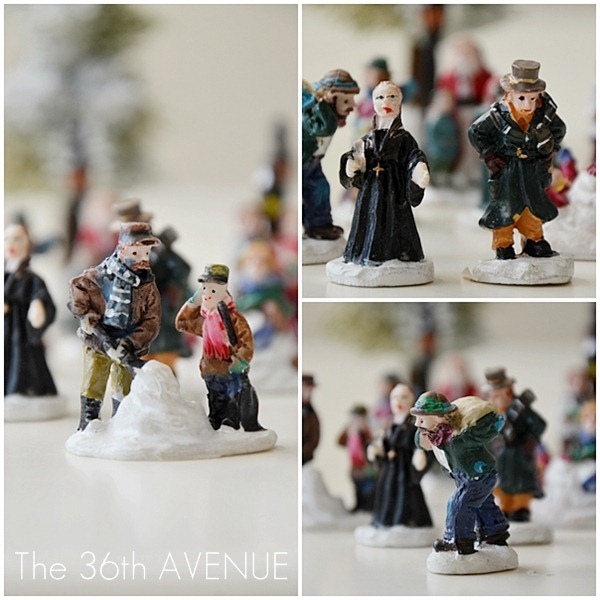 You can see the tutorial for our DIY Christmas Village here. This is a great idea, I know my sister is making it now. This is so gorgeous and so cool! My 6 year old is a little creeped out by this sort of stuff, but would love to do it for halloween though. As soon as i am done sorting out costumes. 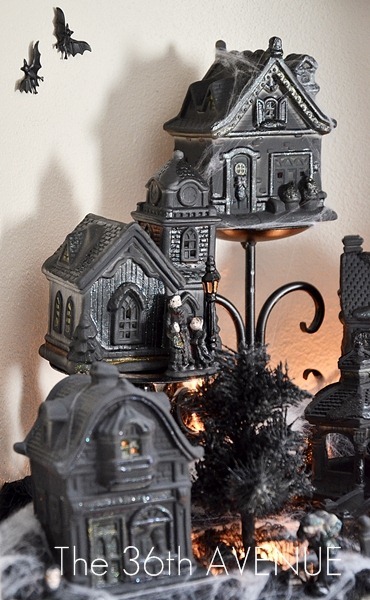 We love our little spooky village… I hope you make your own. It is so much fun! This is one of the coolest projects I’ve ever seen. What a creative transformation. I love the Christmas one too, particular the little color details you added. Sue, you are going to love them… Have fun! Very, very clever! We were just looking at Dept 56’s at $150 a house – although they do have animation at that price and I was saying I would love this but didn’t want to spend that kind of money. Yours is fabulous! So darn cute and creative! I’m sitting outside Dollar Tree (needed gift wrap stuff) right now waiting for it to open and came upon a pin that linked your DIY. Going in to get the makings of this! My little guy will love helping to put this together this weekend. Thanks for the inspiration!